FIBARO Intercom supports high quality video calls and allows for remote home management, as well as improving household security and providing peace of mind. FIBARO Intercom has all the advantages of a modern intercom system. It can be used to allow entry to the home - granting control over who's able to enter - while providing a high level of security. FIBARO Intercom can be installed anywhere near the main entrance or front gate. The device is one of the few available on the market which allows the user to transfer Full HD (1080p) video recordings with a wide viewing angle of 180 degrees (the fisheye perspective). The Intercom makes it possible to monitor and record all visitors to the user's home. It can also register what is happening around the home and property. Plus, the device can serve as an additional camera for the home monitoring system. With an infrared LED, the Intercom can operate in nighttime mode, which automatically activates when low light intensity is detected. This solution allows the device to keep recording in high quality, even after dark. The recorded video files can be stored on an SD card. A single device can be used for managing access to two separate doorways or gateways. With FIBARO Intercom and a set of intelligent locks, the user can forget about house keys - being able to open the door either with a dedicated PIN number assigned individually to each household member, or with a mobile phone, which communicates with the device via Bluetooth or the FIBARO mobile app. Visitors can also be provided with remote access. 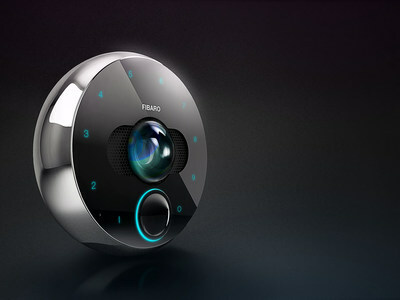 The intercom can be used to conduct video calls based on which (by using the FIBARO app) the user can grant someone access to the home in their absence. In the event that no family members can answer a call, the visitor will be able to leave a recorded video message. A set of built-in speakers and a noise-cancelling microphone provide high quality sound. The Intercom is also equipped with a proximity sensor, allowing it to activate the backlight display when motion is detected, which can help your guests find the doorbell after dark. FIBARO Intercom can be connected to Wi-Fi as well as a LAN network. Even though connecting FIBARO to the FIBARO control unit isn't required for the device to function properly, it provides access to many new features, such as automatic illumination of the area around the main entrance in case any motion is detected. By entering a PIN number or bringing a mobile phone close to the home-installed device, the control unit will be able to disarm the alarm, open the front door lock, and turn on the lights in the hallway. It's also possible to set up several devices within a single household to manage every entrance to the building. FIBARO Intercom is a designer-looking, small round disk with a high-gloss finish. This new device by FIBARO combines exceptional design with cutting-edge technology aimed at owners of single-family homes, small office spaces, and those who rent their houses out to others. FIBARO is an innovative Polish company whose operations are based around the Internet of Things by providing solutions for building and home automation. In just a few years' time, the FIBARO System has spread throughout 6 continents and over 100 countries, becoming one of the most advanced smart home systems in the world. FIBARO is a system that is entirely created and manufactured in Poland - both the company's head office and manufacturing facility are based in Poznan. FIBARO employs nearly 350 people. The company's mission is to enrich people's lives by providing modern solutions that facilitate a comfortable, friendly and safe home environment. For more information about our products and company, please visit http://www.fibaro.com.